Hello everybody! 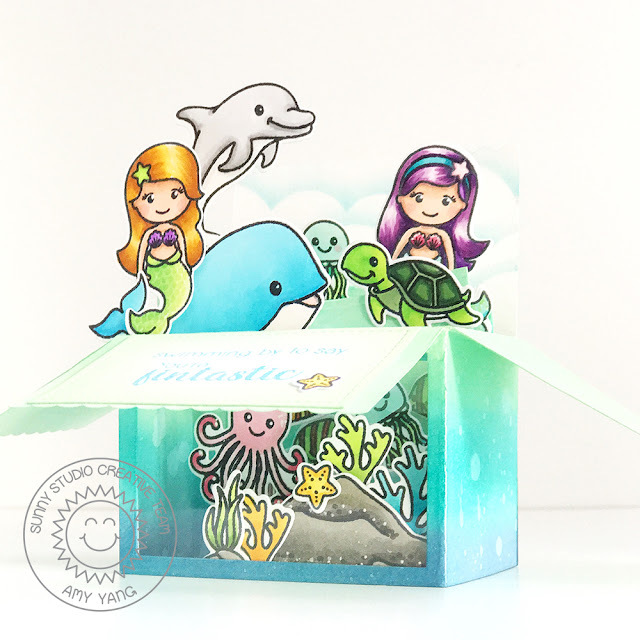 Amy here today to share a pop-up box card featuring the Oceans Of Joy and Magical Mermaids stamp sets from Sunny Studio Stamps. I love how these two sets can be used together to create an scene that is fun and whimsical. For this card, I used a box card die. However, you can find lots of great tutorials online to make your own. To begin, I cut out all the pieces for the box card, I used a rectangle die to create a window for the front bottom of the card. 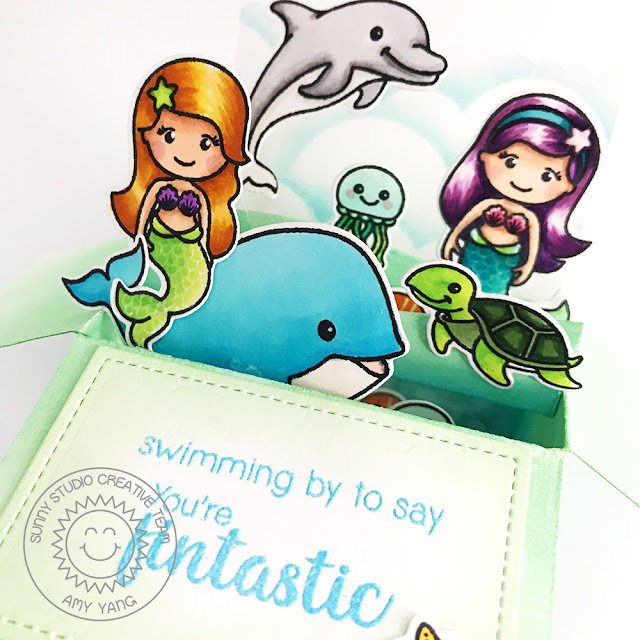 With the die-cut rectangle, I added the sentiment "Just Swimming By to Say You're Fintastic" from Magical Mermaids. I heat embossed it with blue embossing powder. 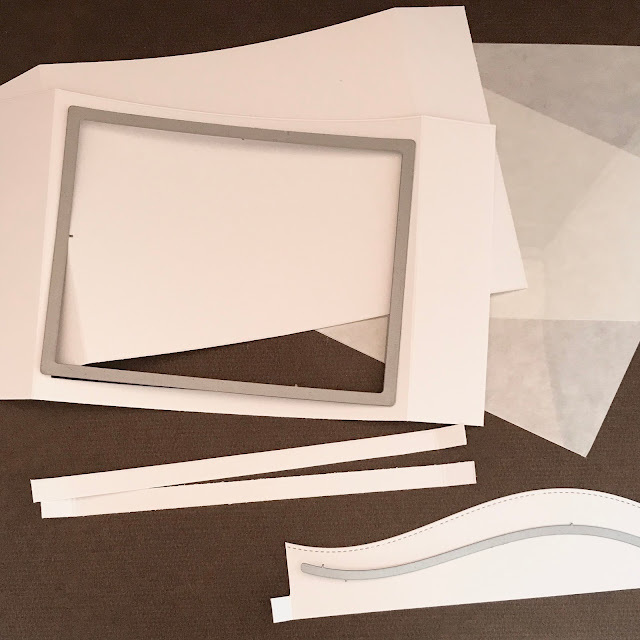 I also trimmed acetates to cover the window, and the two panels (dividers) that goes inside the box to hold the images. This allowed me to create a fun 3D underwater scene. Before assembling the box, I distressed it with Distress Inks in Faded Jeans, Peacock Feathers, and Cracked Pistachios in most areas. I splattered the panels with droplets of water using a brush to add texture, and created clouds with a stencil on the back panel. Once it dried, I put together the box card with double sided tape. 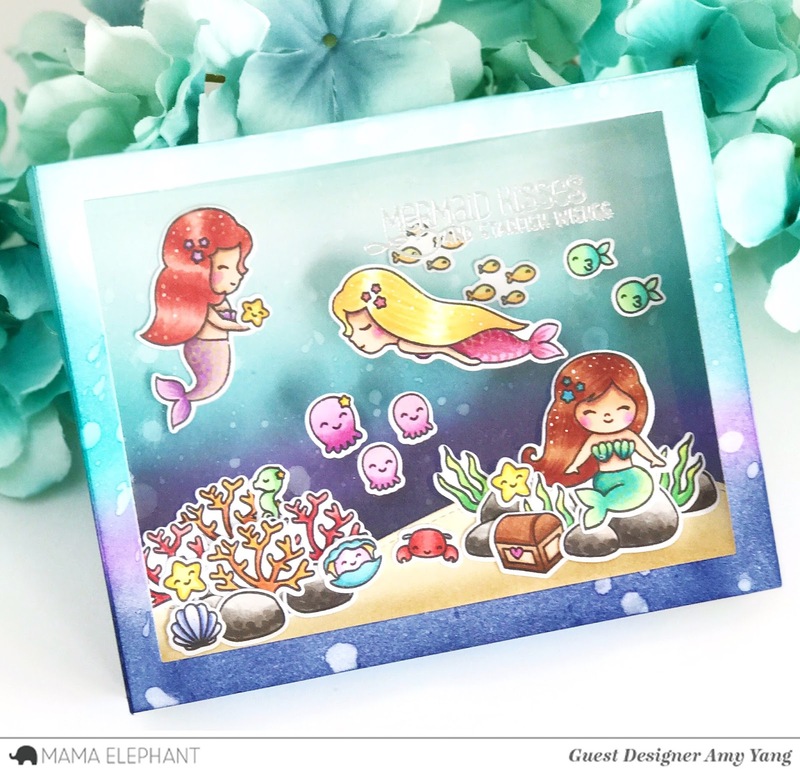 I stamped the images from Oceans Of Joy and Magical Mermaids and colored them with Copic markers. Then, I cut them out with their coordinating dies. To finish, I adhered the sentiment rectangle to the front flap and the images to the card. Thank you so much for stopping by today! 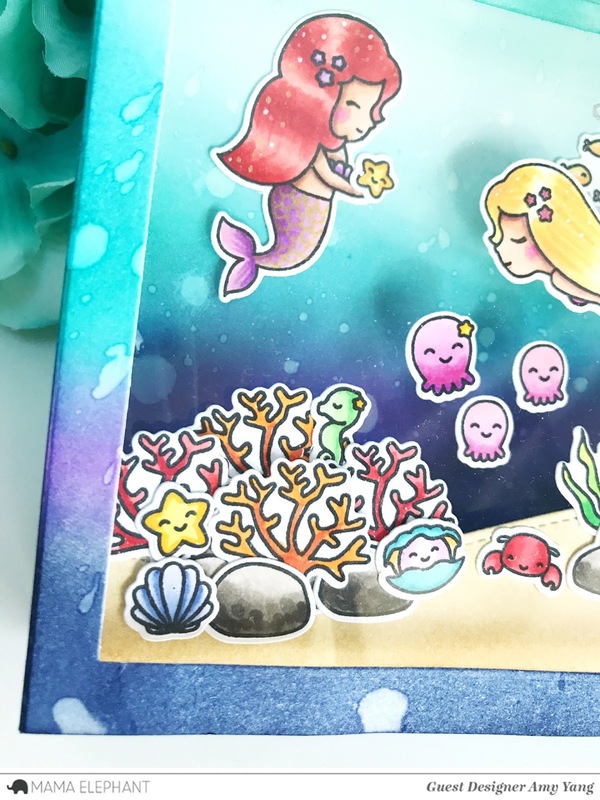 I hope you enjoyed this post and I have inspired you to try creating your own ocean scenes with the two adorable stamp sets. Happy Monday! I'm stopping by today to share a box card I made using a lot of wonderful Pretty Pink Posh products. I love creating box cards (one of my favorites), because they are fun to make. They also have that "wow" affect when the recipient receives the card and it displays so nicely. I started by making my own patterned paper (that will be used on the box card) and a matching A2 envelope. I stamped the images from Bold Blooms and Build A Bloom using dye inks. Then, I stamped the girl and the boy from Friends Forever, the little critters, tree trunk, and mushrooms from Woodland Critters, and the bees from Bee Friends. I colored them with Copic markers. I also stamped some blue ferns from Build A Bloom using dye inks. I made a box-card that will fit in an A2 size envelope. Sorry, I don't have the measurements today, but you can find lots of good tutorials online. I added the trimmed cardstocks around the box, using the patterned cardstock I made along with some paper I had in hand. I stamped the sentiment "Thinking of You" from Bee Friends with Versamark ink and heat embossed it. I die cut the hills panel using one of the dies from Stitched Borders. I added the fence that I die cut using Picket Fence. To finish, I arranged and adhered all the elements to the card. I attached the bees and the butterflies to stripes of acetate so that they can look like they are flying, and you can also make them move. Thanks for stopping by the blog. Have a wonderful week ahead! Hello everybody! 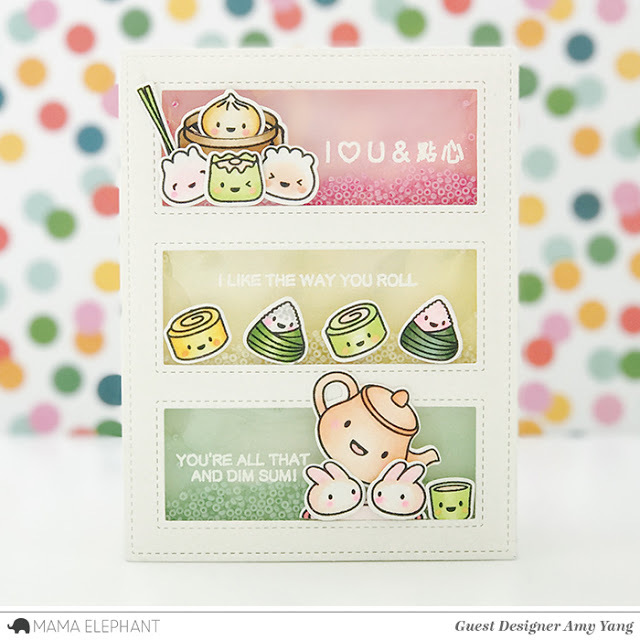 Amy here to share with you two projects I made using the awesome Dim Sum Fun stamp set for Inspiration week. Honestly, this set can't get any cuter! Something about adorable food images just makes me smile. For both cards, I stamped the images from Dim Sum Fun on smooth white cardstock and colored them with Copic markers. Afterwards, I cut them out with their coordinating creative cuts. I love how the bamboo steamer die creates slits, so that you can tuck in the images instead of taping them on. It adds a fun interactive aspect, especially on my second card where you can move them around. For my first project, I made a fun shaker card. To create the windows, I used Tri Window Cover Creative Cuts. I added three sentiments on this card, I thought they went well together. It's such a cute way to tell someone you love them and that they're awesome, don't you think? For the next project, I made a birthday card. To add more interest, I borrowed images from other stamp sets. I used the tiny balloons and sign post from The Cat's Meow and the streamers from Party Kit. I colored the images and added little dots to the card front with Copic markers. To frame the card, I die cut white cardstock using Frame Tags Madison Avenue Creative Cuts, and adhered it with foam tape for dimension. Now these dim-sums are ready to party! I hope you've enjoyed the Dim Sum Fun Inspiration Week. Don't forget to come back tomorrow, as we start a new week with Mermaid Kisses. Hello everybody! Today I'm sharing birthday card using Sunny Studio Stamps Oceans Of Joy stamp set and its coordinating dies. 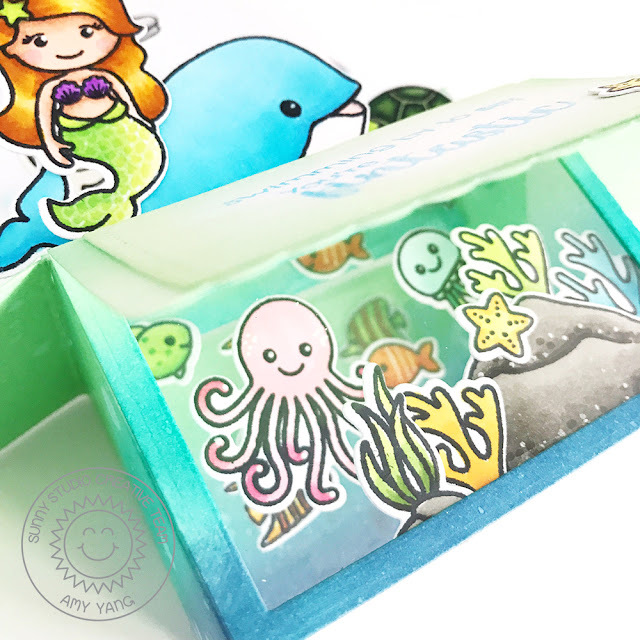 I just love how this set is filled with nine adorable sea creatures, in addition to stamps that will help you create wonderful scenes. For the card front, I used Distress Inks in Tumbled Glass and Peacock Feathers on die-cut smooth Bristol cardstock. After I was done blending, I added small splatters of water using a paint brush. Next, I die-cut two trimmed vellum paper using one of the dies from the Stitched Scallop set to create waves. I distressed the die-cut clear vellum paper using Peacock Feathers Distress Ink. 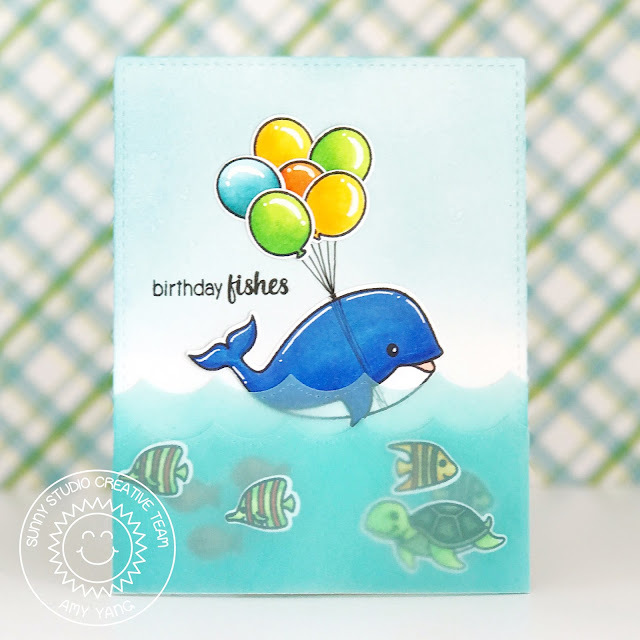 I stamped the images from Oceans Of Joy stamp set, and cut them out with coordinating dies. To create the look of depth, I added the fish and turtle in between the layers of the die-cut vellum waves that was wrapped around the back of the card front, and taped to keep it in place. Then, I arranged and adhered the balloons to the card front. I used my Copic liner to draw lines from the balloon to the whale. I made it look like the string was wrapped around him to make it fun and whimsical. 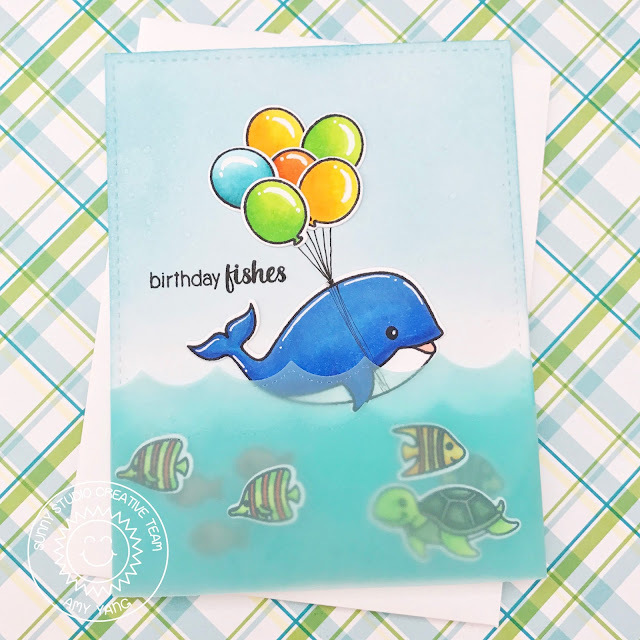 To finish, I stamped the punny sentiment "Birthday Fishes". How cute is that whale?! I hope you enjoyed what I shared with you today. Thanks for stopping by the blog! Hello there! I have a summery card to share with you today. This card was inspired by the flowers that are blooming in my garden. It's such a beautiful time of the year. I used a mixture of different Pretty Pink Posh stamp sets to make this card; it's a great way to get the most out of your stamps. For the front images, I used daisies and leaves from Bold Blooms, the stems from Build A Bloom, and some adorable bees from Bee Friends. I stamped them with Black Versafine ink on smooth Bristol cardstock and colored them with Zig Clean Color Real Brush Markers. I trimmed Bristol cardstock for the card front. Then, I distressed it using Worn Lipstick and Fossilized Amber Distress Oxide inks. I also added some splatters of Worn Lipstick that was diluted with water using my brush. Once dried, I stamped the sentiment, "I will always remember your kindness" from Thoughtful Greetings set. Love this sweet sentiment! I die-cut the frame using the Scallop Frames dies and added two layers of foam tape, adhering it to the card front. Then, I added the colored images and adhered some with double sided tape and others with foam tape to give it a layered and dimensional look. To finish, of course I added my favorite 6mm Ballerina Pink sequins. 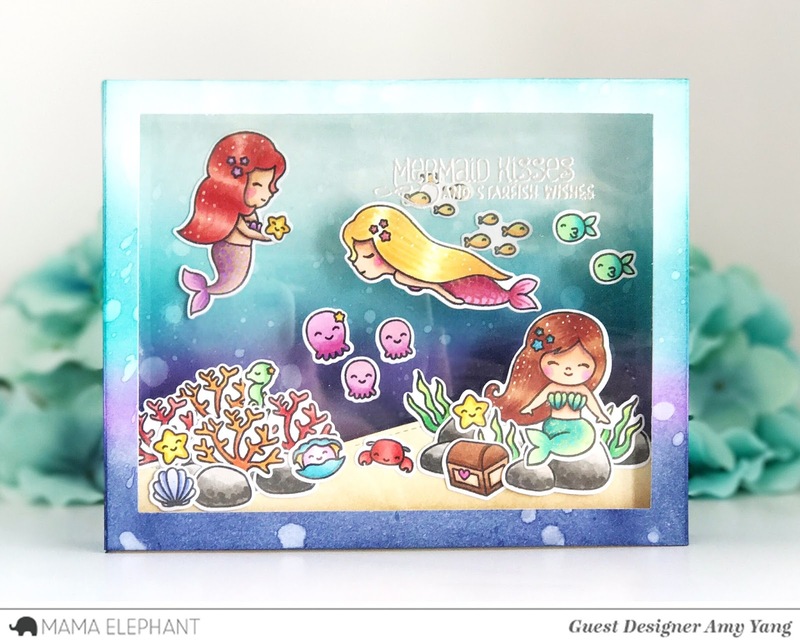 Today, I'm sharing a diorama/box card featuring the new Mermaid Kisses stamp set and the coordinating creative cuts. 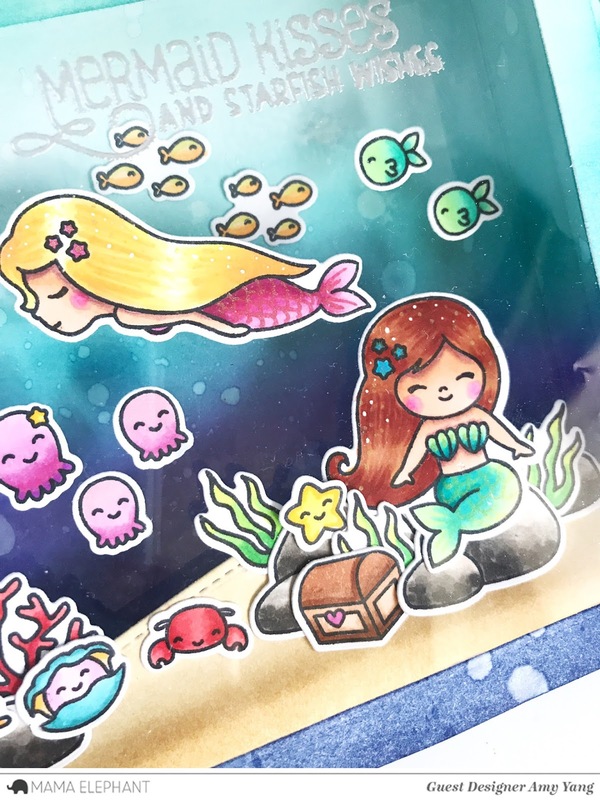 The set contains three beautiful mermaids, lots of lovable sea critters and great scene building images, perfect for creating magical and dreamy underwater scenes. All the images were stamped on smooth white cardstock and colored with Copic markers. They were then cut with coordinating dies. I added details on the mermaids with Sakura Gelly Roll pens. Just in case you're interested in making this project, I've included the card making process below. Trim two smooth Bristol cardstock to 8 1/2" x 5". This will be the front and the back of the box. Score lines at 1 2/8 and 7 2/8. Die cut one of the cardstocks in the center with the largest frame die from Peek A Frame creative cuts. This is to create a window for the box. Once completed, it will look like a mini fish tank. Ink blend the areas that will be visible from the front using Distress Inks in Chipped Sapphire, Wilted Violet, and Peacock Feathers. Splatter water with a paint brush. Trim two acetates to 6"x 5". I used heat resistant acetates to heat emboss the sentiment to the front of the acetate. The second acetate is used inside the middle of the box to make the images look like they're floating/swimming. Trim Bristol cardstock to 7" x 2" and score lines at 4/8" and 6.4/8". 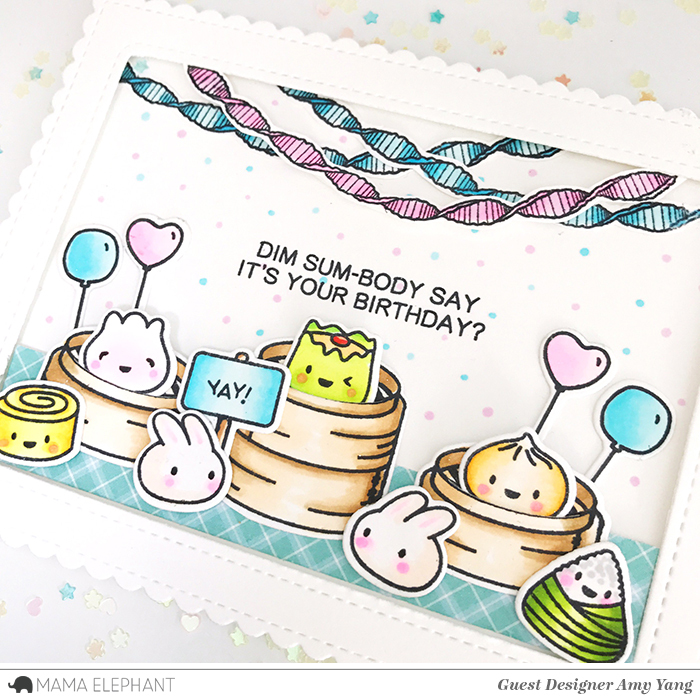 Die cut the cardstock with the wavy border die from Landscape Trio Creative Cuts. Distress it with Antique Linen and Gathered Twigs Distress Inks. 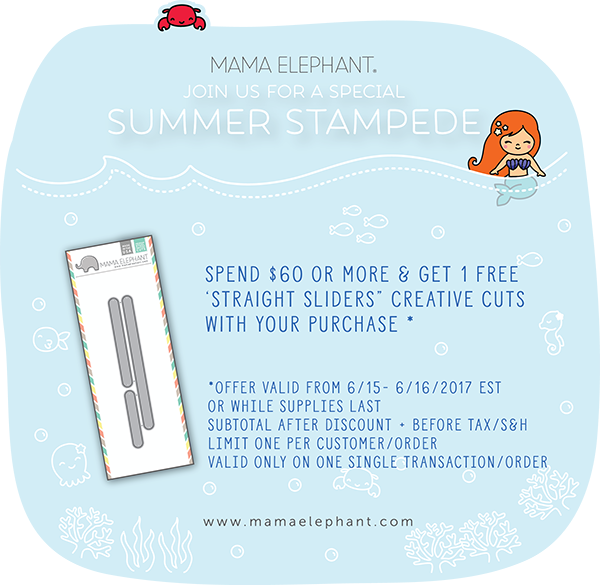 Trim 2 cardstock to 7"x 2/8". Score lines at 4/8"and 6.4/8". These two thin panels will go inside the box to hold the acetate. Ink it with Peacock Feathers Distress Ink, to blend in with the box. Attach the red hair mermaid and some fish to the back panel. Adhere the acetate on top of the two thin strip panels. One on the top and the other in the bottom. Then adhere that to the back panel and add the mermaid with yellow hair, jelly fish and the green fish. Adhere the rest of the images to the sea floor panel then attach the folded flap to the back panel. Make sure to create distance from the acetate and not pressed against the front either. Heat emboss the sentiment from the stamp set to the second acetate. Then adhere it to the back of the front panel to cover the window. To finish, adhere the front panel to the back panel. This card folds flat to 7.2/8" X 5"
It fits comfortably in an envelope that is 8.2/8" x 5.6/8"
Hello everybody! I'm here today with a card using the Stars and Stripes stamp set from Sunny Studio Stamps. 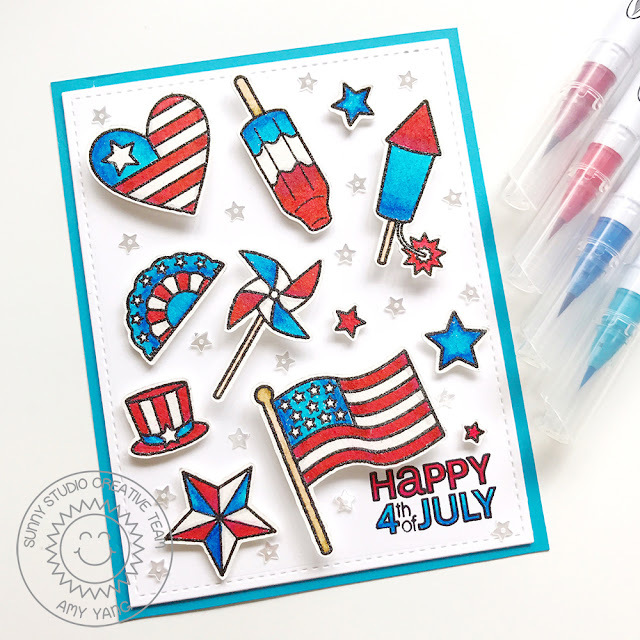 I used this set to make a Fourth of July card, but you can also use some of the images and sentiments for birthday cards as well as cards for the super heroes in your life. I just love the versatility of this set. To begin, I knew I wanted to do some easy coloring with Zig Real Color Brush Markers, so I stamped the images on watercolor paper with Black Versafine ink. Then, I applied clear embossing powder over it, and set it with a heat gun. This helped me color inside the lines, and it also added a nice raised (and shiny) texture to the outlines of the images. I tried to capture that in the photo below. Before adhering the images to the card front, I stamped the sentiment that is included in the set. To add interest and dimension to the card, I used foam tape behind the images (some with one layer and others with two) to adhere them to the card front. To finish, I added some stars sequins. I hope you like today's card. 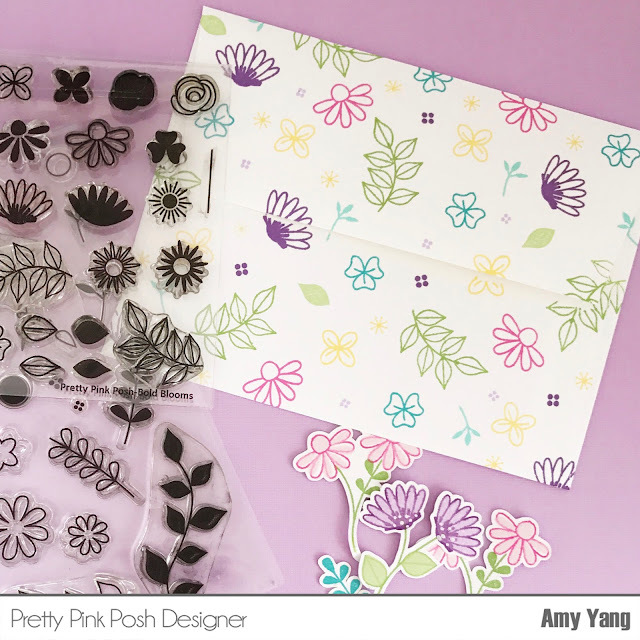 This design can be used with just about any stamp set. It's really simple to do, and tons of fun to make! Thanks for stopping by the blog today. Have a fabulous Wednesday! Hello friends, I hope you had a wonderful weekend! I'm happy to announce I will be joining the amazing Pretty Pink Posh design team again. I'm so thankful to sweet Paulina (owner of PPP) for this great opportunity. To celebrate, I made a card using some of my favorite PPP products to share with you today. 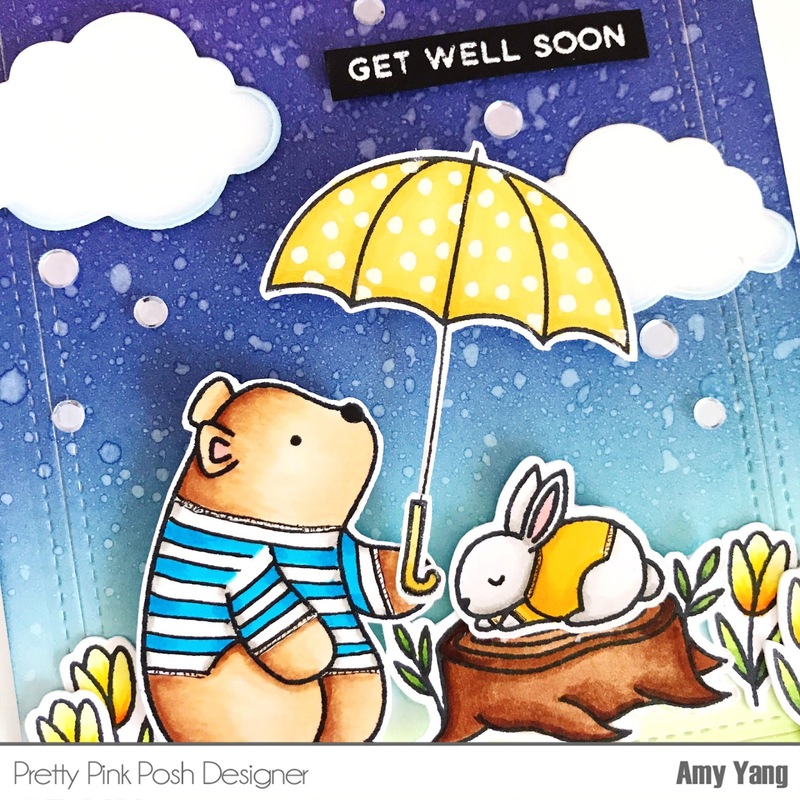 My card features Woodland Critters, Rainy Days stamps sets and Stitched Notes dies. I love cute critter images with clothes, it gives them such a fun and whimsical look. So, whenever I can, I like to dress up my stamped critter images. For the bear and the bunny, I drew simple lines with the copic liner to create T-shirts for them...and that's it. Don't they look so cute? I think this is a great way to get more out of your stamps. All the stamped images on the card were colored with Copic markers and cut out. To create my front panel, I trimmed smooth Bristol cardstock to a A2 size, and distressed the background with Distress inks. Using the blending tool, I added Twisted Citron and Mowed Lawn on the bottom working my way up with Peacock Feathers, Broken China, Chipped Saphire and Wilted Violet. Then, I die-cut that panel with with the frame die from Stitched Notes set. It added beautiful stitched detailing to the panel. To create more interest to the card, I also die-cut clouds using the cloud dies from Rainy Days Dies set. The sentiment, "Get Well Soon" is from Rainy Days set and I stamped it with Versamark ink and heat embossed it with white embossing powder. After adhering all the images to the front panel, I added some pretty sequins from Pretty Pink Posh to finish my card. There's a great giveaway in the honor of the new team on Pretty Pink Posh blog and on instagram. Don't forget to visit and enter for your chance to win. Good Luck! Hello crafty friends! I'm so excited to share with you a card I made using lots of wonderful Pretty Pink Posh products. To create the background panel, I used an acetate stencil I made using a cloud like border die from Stitched Borders 2 and added clouds with Distress inks. Then, I die-cut trimmed cardstock with the wavy scallop border die from Scallop Borders to create the ground panel for the pandas to sit on. I added Distress Inks there too. On the ground panel, I heat embossed the sentiment "You're My Favorite" from the Friends Forever stamp set. For the frame, I die-cut white cardstock using the larger Scallop Frame. Here comes the fun part. 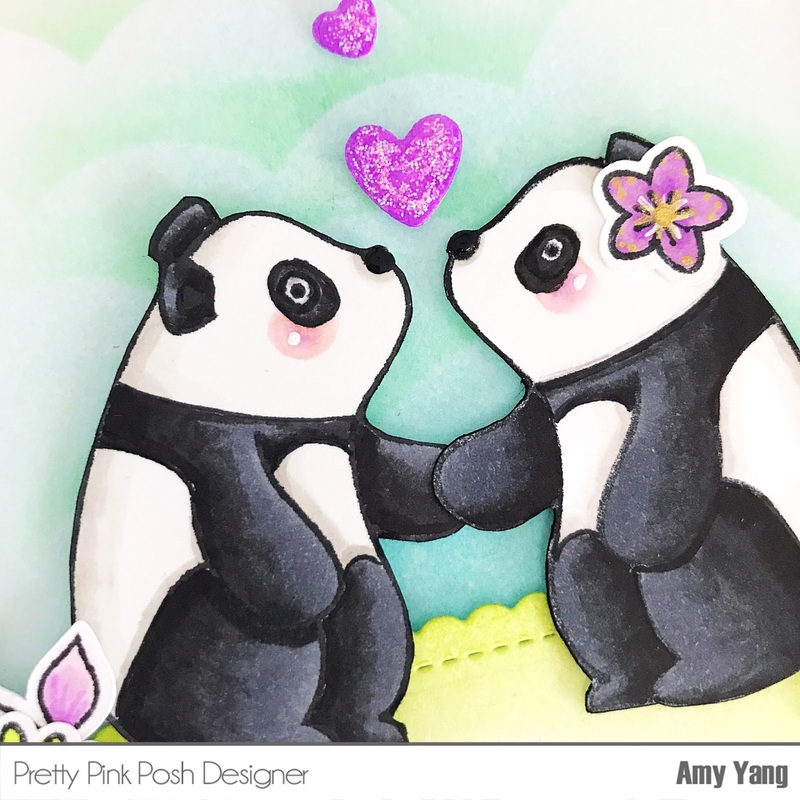 I mirror stamped (here's a link to a mirror stamping video tutorial by Jennifer Mcquire ) the adorable bear from Woodland Critters so I could create a couple facing each other and holding hands. Awwww, right? Then, I took it one step further and decided to make them into pandas (see picture below). 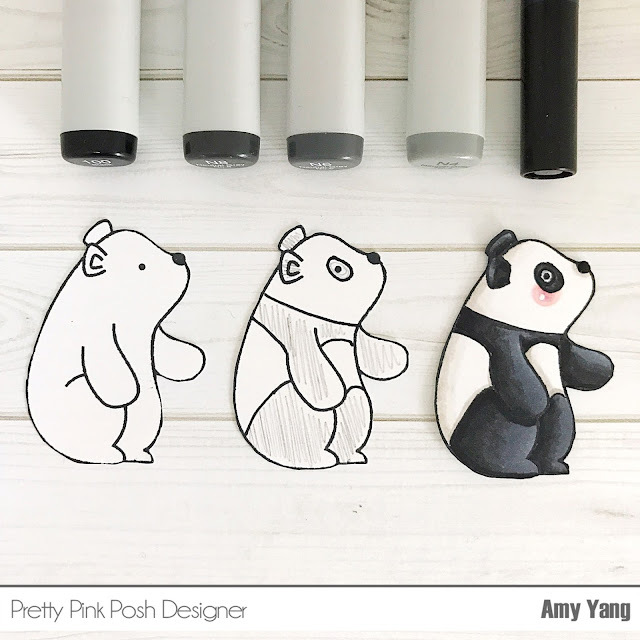 I used a Momento black marker to draw in the lines, and colored in the bears using Copic markers: 100, N8, N6, and N4. I also used W1 and W00 in the white areas. To added more interest the the card, I used flowers and leaves from Build A Bloom and Bold Blooms stamp sets. Luckily, I had a whole bunch of them stamped and cut for times like this. I colored them with Copic markers. I also added hearts that I die-cut using the dies from Bee Friends set. I colored them with Copics and added Stickles for shine. I hope you like today's card. 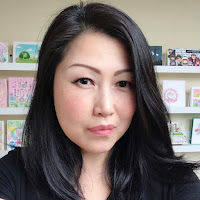 I had so much fun playing with Pretty Pink Posh products and getting creative. I hope I have inspired you to create some cute little pandas. Thanks for stopping by the blog today! Have a fabulous day! Hello there! I have a fun interactive card to share with you today. I made a wobble card using a rubberstamp, T Bird Bear in Airplane from Purple Onion Designs. This stamp is part of my favorite collection, Happy Trails designed by Stacey Yacula. To make my card front, I added a circle masking paper (to create the moon) to a diecut frame Bristol cardstock. Then, I distressed it with shades of blue Distress Inks. Next, I splattered slightly diluted Copic OpagueWhite Pigment using a paint brush (tapping the handle). Once the background was completely dried, I stamped the sentiment from Journey Sentiment Set using Versamark ink, added white embossing power and set it with a heat gun. Then, I adhered the die-cut stars. I used Lots Of Stars Creative Cuts from Mama Elephant to make my stars. 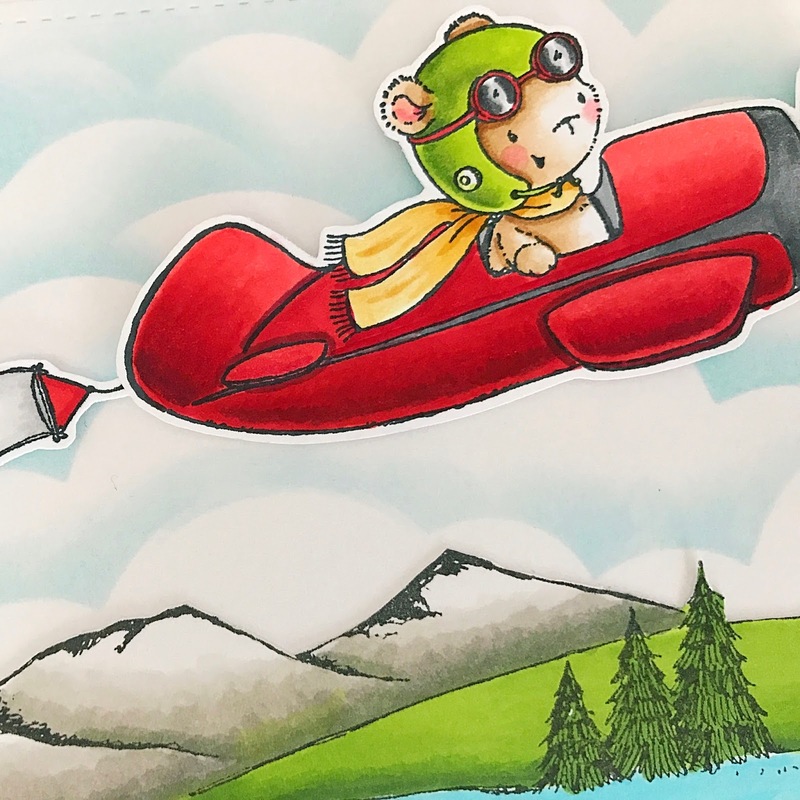 I stamped the super cute, T Bird Bear in Airplane on smooth white cardstock and colored it with Copic markers. I also added some gray copics to the moon and then white Wink of Stella for shine. I think it also helps to give it a glowing look. I love making interactive cards so I made the image wobble. I made a simple wobbler using craft wire and tape. I hope you enjoyed the post. 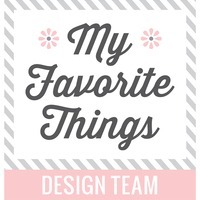 Make sure to check out the awesome new collection, if you haven't yet from Purple Onion Designs, and visit the blog for awesome inspirations. There are 2 new collections from Stacey Yacula. 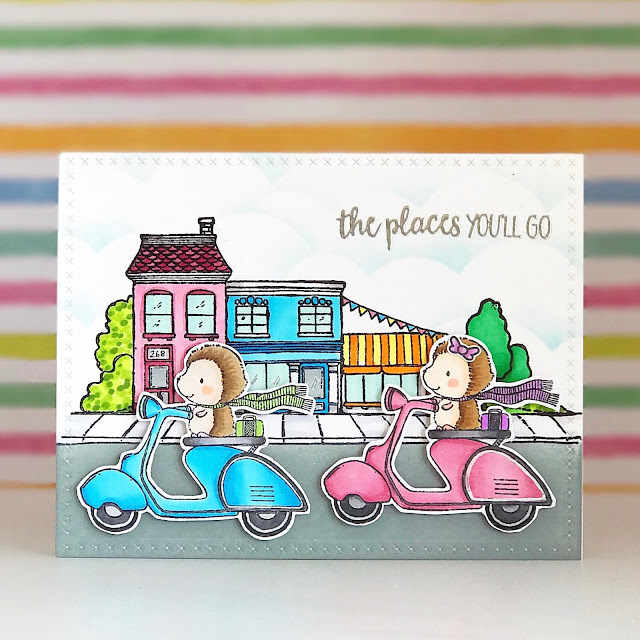 The first is the Happy Trails collection which consists of 33 adorable travel and vacation related stamps. A few of the stamps are grouped together in this collection and sold as sets. The second collection is a mini collection of 4 reading related stamps called Once Upon A Time. You can purchase both complete collections for a limited time at a discounted price of a little more than 30% off! The entire Happy Trails collection is $120.00 and Once Upon A Time is $15.00. This special runs until Sunday, June 11th. You can purchase the entire Happy Trails here and Once Upon A Time here. In addition, there are two separate coordinating sentiment sets. The Great News Sentiment Set works nicely with the Once Upon A Time collection. The Journey Sentiment Set can be used with the Happy Trails collection. These sets are versatile enough to use with all types of images as well. Thank you for stopping by my blog today! Have a wonderful day! Hello everybody! 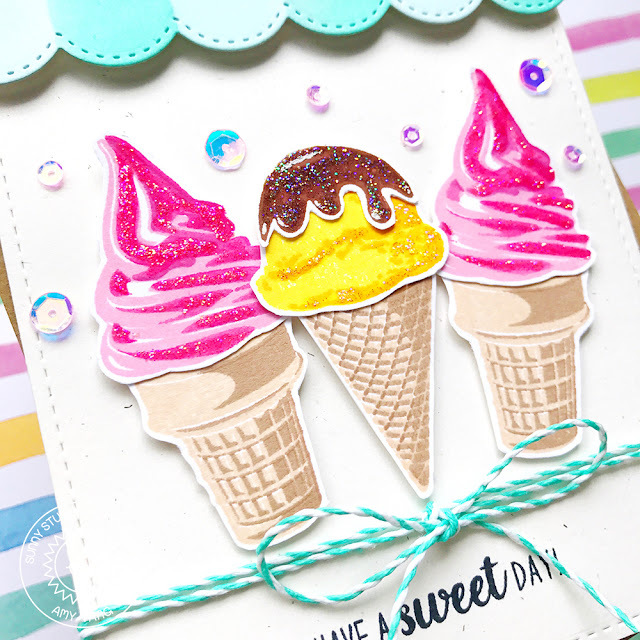 Amy here, and today I have a card that features Two Scoops, a fun layering stamp set. 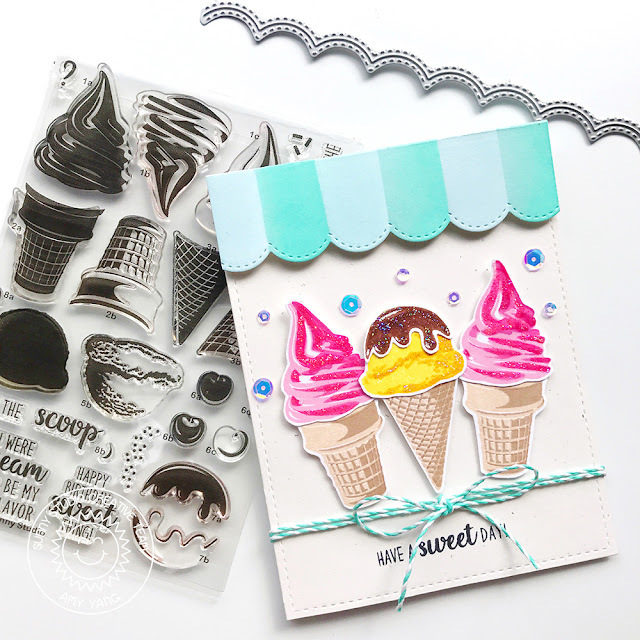 This set is perfect for making summer cards and/or for someone that loves ice cream (and who doesn't love ice cream). The results of the stamp layering will definitely "WOW" the recipient. I know I was taken back by how awesome they looked once I found the right color combinations. To begin, I stamped the ice creams with various dye inks and cut them out with their coordinating dies. I added Ranger Stickles Glitter Glue in Icicle to add shine to the ice creams. After, I put them aside to dry. 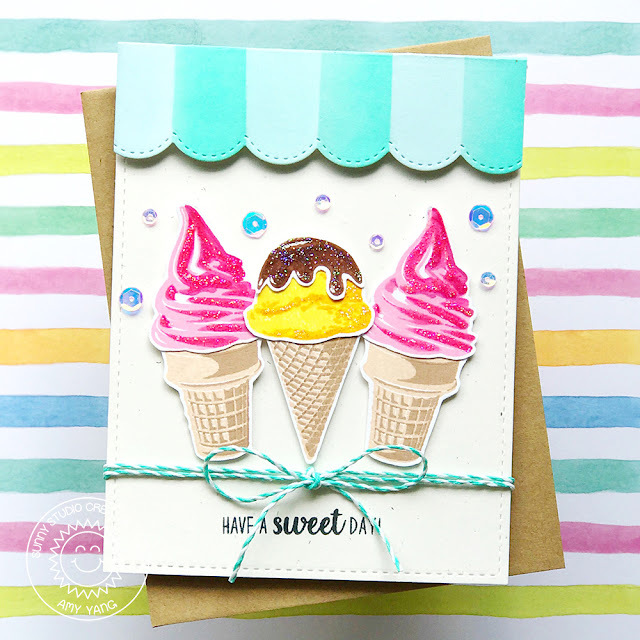 To add more interest to the card front (a play on the awning of ice cream parlors), I added a border that I die-cut with one of the dies from Stitched Scallop Dies. I used masking tape to help me color in the sections with alternating dye inks. I adhered the scallop border with two layers of foam adhesive. I just love adding lots of dimension to my cards. 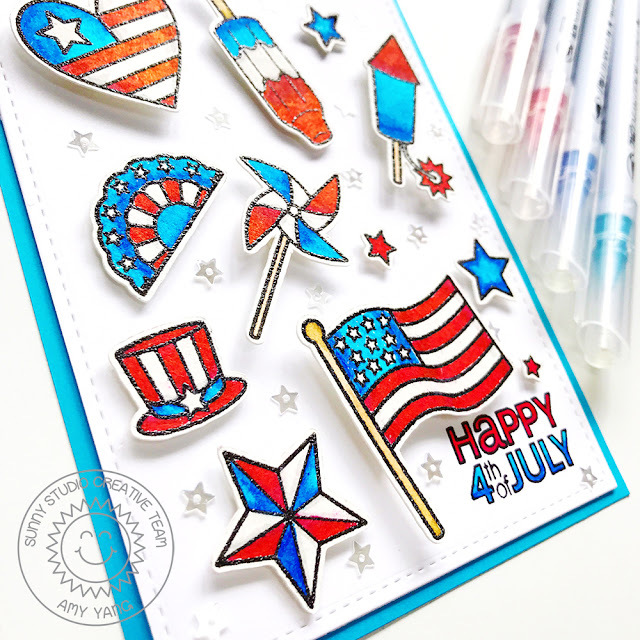 Before adhering the ice creams with a single layer of foam tapes to the card front, I stamped the sentiment "Have A Sweet Day" from Perfect Popsicles set. For that extra sweetness, I tied a hemp cord around the card front and adhered some pretty sequins for more sparkle. I added fun foam behind it, except in the areas with the cord. To finish, I adhered it to the card base. Thank you for stopping by the blog, and have a great day! Hello crafty friends! I'm stopping by to share a card I made using few of the new rubber stamps from Stacey Yacula's fabulous collection-Happy Trails, available for purchase at Purple Onion Designs. 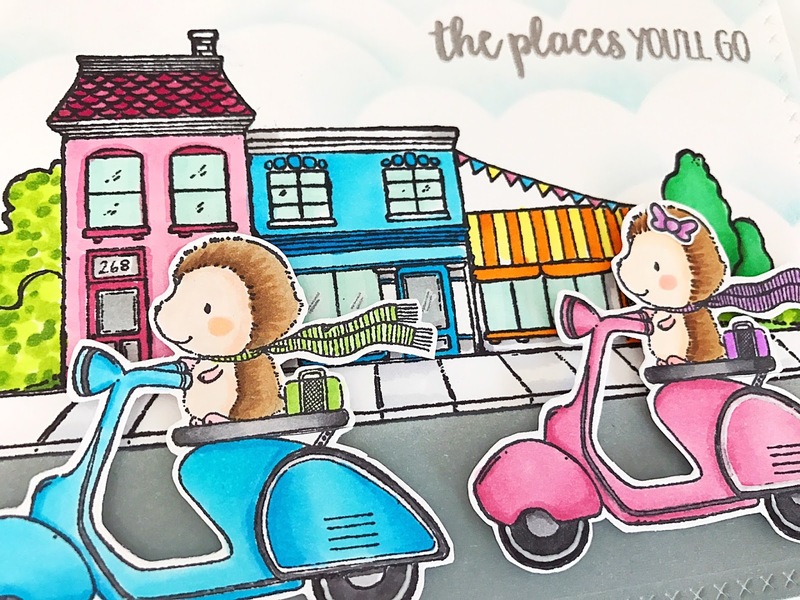 How cute is the Cruiser Hedghog On Vespa Moped! I'm totally in love with the adorable hedgehog! So, instead of just using one image, I decided to make a boy and a girl traveling down the Street. To make my card, I stamped the Street stamp on smooth white cardstock and colored the buildings, sidewalk, trees, and bushes with Copic markers. I used Distress Inks for the sky (using a acetate cloud stencil) and the street. I added the sentiment "The Places You'll Go" from Journey Sentiment Set using Versamark Ink and heat set silver embossing powder. 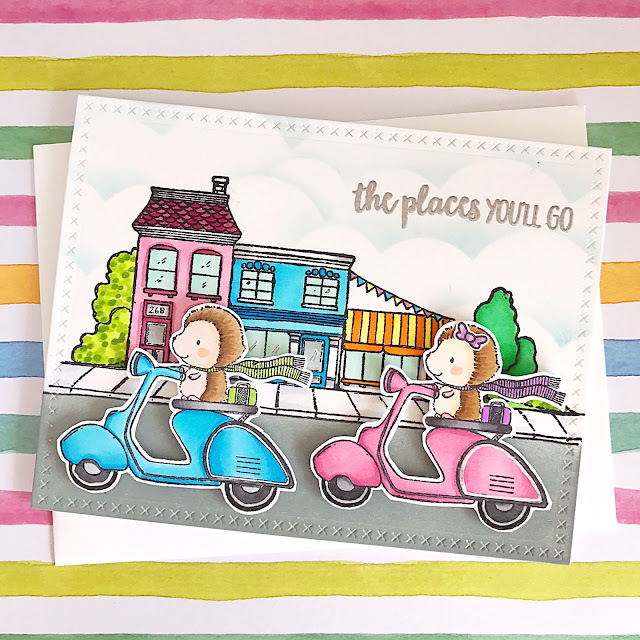 Then, I stamped the Cruiser Hedghog On Vespa Moped twice on smooth white cardstock and colored the images with Copic markers. For the girl hedgehog, I added a bow on her head (from another company). To finish, I mounted the fussy cut hedgehogs with foam adhesive onto the card front and adhered that to the card panel. 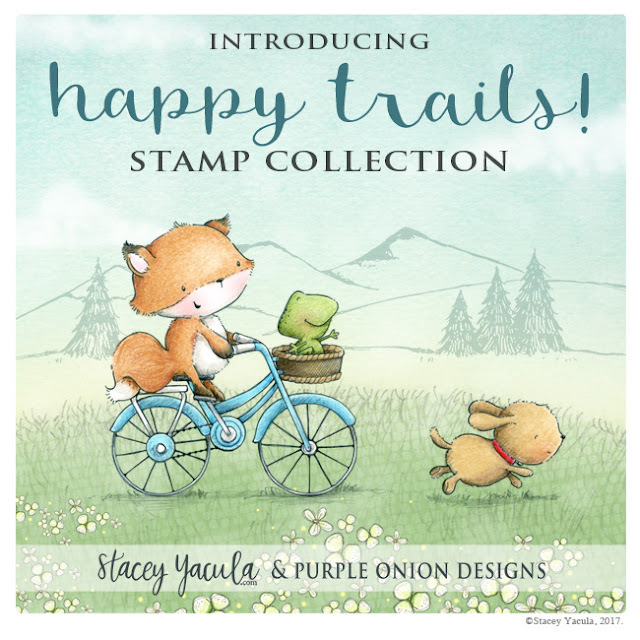 I'm super excited to announce the new Stacey Yacula's Happy Trails collection is now available for purchase at Purple Onion Designs. From now to June 11, 2017, the complete collection of Happy Trails (33 individual stamps) is on sale for $120.00 USD, saving you a little over 30% off. Woohoo! There is another small collection, Once Upon A Time (4 Stamps) that is also on sale for $15.00 USD, saving you around 30%. This sale is available until June 11th. Please note: The two sentiments sets "Great News Sentiment Set" and the "Journey Sentiment Set" are separate coordinating stamp sets, and not part of the complete collection. I'm totally in love with the entire collection of Happy Trails, and I've made several cards with them. I'm looking forward to sharing them with you. I had so much fun coloring the super cute images and making cards with them. I'm sharing two cards today, and here's the first one. For this card, I used the T-Bird Bear In Airplane, Banner, and Mountains rubber stamps. 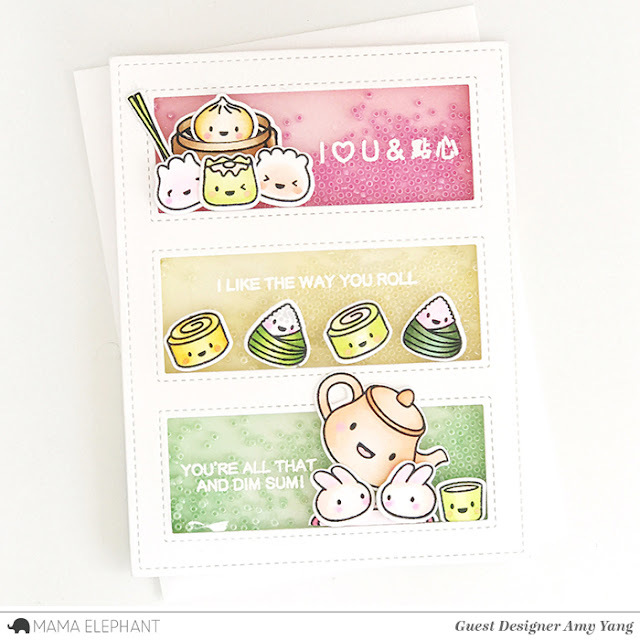 I stamped the images on smooth white cardstock and colored them in with Copic markers. I added a ocean to the mountain stamp by coloring in the lower area with shades of blue instead of making another grassy hill (ok...the trees look like they are in the water, let's just call it high tides). The stamped hello on the banner is from the Sweet Summer Sentiment Set. Then, I fussy cut them out. Before adhering the images to the card front, I added faint clouds to the background using Distress Ink in Tumbled Glass with an acetate stencil I made with a cloud die. Then, I adhered the mountains with double sided tape to the card front. For the T-Bird and the Banner, I adhered them using foam adhesive for some dimension. For this card, I stamped the Mountains directly on smooth white cardstock and colored it in with Copic markers. I also lightly inked the background with Distress Ink in Tumbled Glass. Then, I stamped the sentiment "The Sky's the Limit" from Journey Sentiment Set with Versamark Ink and heat embossed silver embossing powder. 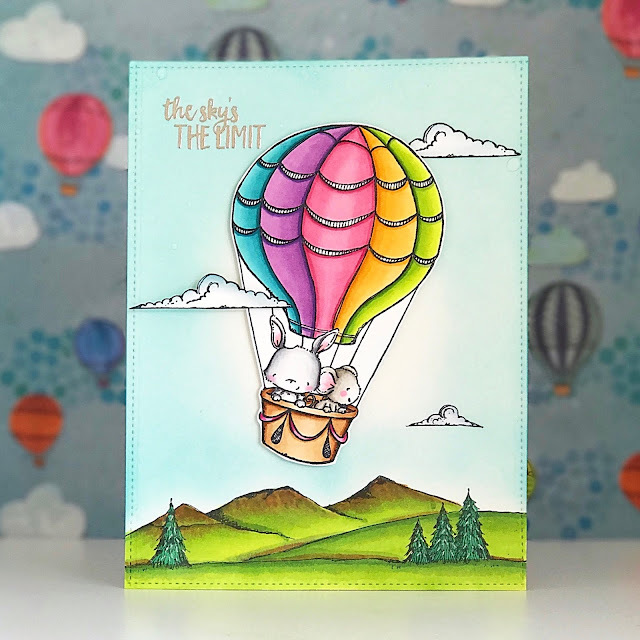 I stamped the Up and Away-Hot Air Balloon and Clouds stamp, colored them with Copic markers and fussy cut them out. I added double sided tape to two of the clouds and placed them on the card front, and adhered the hot air balloon and the the last cloud with foam adhesive for dimension. Don't forget to check out the Purple Onion Designs website for the entire collection of Happy Trails and the Blog for more inspiration and awesome projects from the Design Team.